_MAL6768, originally uploaded by Michael A. Lowry. I'm not dead — just very busy! I'm vacationing with family on Cape Cod in Massachusetts, and have been here in the U.S. for about a week. A few days ago I attended my friend Hugh's wedding (my brother Ethan was one of the groomsmen). Now I'm just relaxing and taking it easy. The house where we're staying is right on the Swan River, and the view from the back porch is really quite nice. It's relaxing and calming to sit outside and watch the river flow by. The river actually flows upstream when the tide comes in because we're just a few hundred meters from where the river empties into the Atlantic ocean. 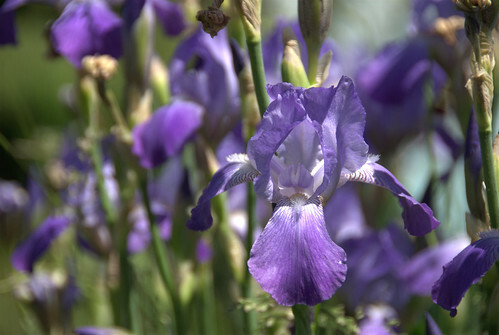 I took this photo of the purple irises growing behind the house three days ago when we had good weather. Right now the sky is cloudy and the temperature is cool. I hope the sun comes out again tomorrow so we can go kayaking in the river.